True value from a healthcare ecosystem can be derived when there is a balance between the cost for care and the outcome from it i.e. Healthcare spend and Patient impact. What Information is expected to provide is better insight and feedback on what is most effective and is required to be done in the healthcare eco-system. For e.g. it should prompt patients to make healthy lifestyle changes by exercising on a regular basis and having healthy diet in addition to be more involved in their treatment in the event of their falling sick. During care, information exchange should happen in a seamless manner across all the concerned stakeholders resulting in a coordinated approach and avoidance of duplication of efforts. The right type of provider should also be prompted given the nature of care needed. This will increase chances of better outcomes given that the skills of the selected provider would be ideally suited to the case in hand. In terms of provider better value, the care should be most cost effective without any compromise on quality. Finally information is expected to increase the pace of innovations resulting in newer and safer methods of handling care and finding path breaking solutions in areas which have proven to be impregnable. It is expected to lead to better R&D productivity is discovery and development. Thus inclusion of Big Data in the fold of healthcare is expected to bring all of the above mentioned changes in the existing setup and transform the way in which care is provided moving forward. The emphasis is clearly on providing better outcomes at minimum cost without compromising on quality in any capacity. Implementation of the Medicare and Medicaid EHR incentive programs has led to widespread adoption of EHRs everywhere. With the prospect of adoption of Big Data in Healthcare Industry very likely , the impact on EHRs is going to be an important factor to consider. The ones in use are not actually built to store large clocks of data . Since they are primarily designed to facilitate day-to-day patient care they are also at this stage not capable of handling the capacity of data created by various medical tools. The obvious solution is to create more advanced EHRs moving forward. For the existing ones, a stop gap solutions being used by some stakeholders is that of using auxiliary systems for the storage of data. 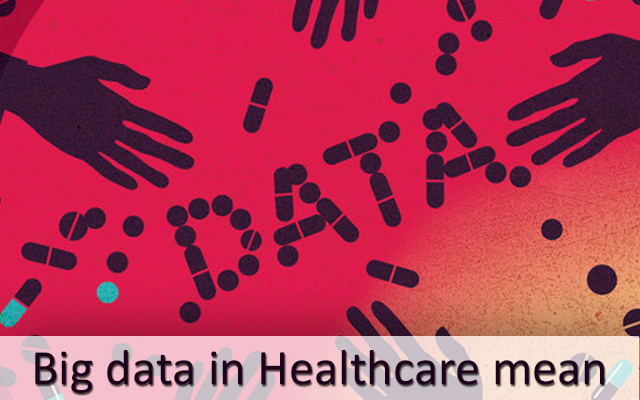 Another important thing to be noted here is that the potential benefits of Big Data is based on the assumption that that providers have readily available information and they make evidence-supported decisions using analytic tools. Analytical tools are of no value if reality is far removed from this assumption. There is also this concern of ensuring privacy. With more real-time, personalized data from a range of sources available, having defined and proven methods of securing their safety, includes during transition as well, is of high priority. Some stakeholders have expressed that as much as they happy and upbeat about the potential opportunities, they cannot help but also be concerned about the scrutiny and potential law suits that are likely to happen related to data security issues . As a solution, defined steps will need to be identified , agreed upon and subsequently adhered to by all concerned stakeholders to ensure that likelihood of such risks are kept at a minimum. Also to be able to make optimum use of the opportunity Big data will throw up, strong expertise needs to be developed in the areas of Data Analysis, Data Management and Systems Management. This is bound to create a need for human talent, who are thoroughly trained, to take up important roles in the entire eco-system. The early adopters who are keen on taking on the challenge of changing their mindset and embracing something which can redefine the future of this industry are going to benefit a lot from it. However back up from strong leadership is what will be the key in these organizations from a successful outcome. In addition, Healthcare software testing companies would play a major role as well in testing the solutions being rolled out. They will be required to be thoroughly involved in setting up goals, determining and closing the gaps, designing the approaches of rolling out initiatives and finally ensuring continuous improvement. This Post was posted in Health Care and tagged emr software developers, emr software development india, healthcare it services, healthcare mobile app companies, healthcare mobile app development, healthcare software development, healthcare software integration, healthcare software maintenance, hire healthcare integration specialist, hire healthcare software developers, hl7 interface development services, internet-based medical billing software development, iphone healthcare app development, iphone medical app developers, Medical Software development, mobile health app development, mobile healthcare application development, mobile medical app developers, offshore healthcare software, offshore mhealth development, online patient portal development, outsource mhealth development, software services for healthcare. Bookmark the permalink.